Did anyone tell the students that their education system is changing..? Educators are increasingly aware of the need to provide learning opportunities that are more active in their nature. As educators have accepted this shift, we have identified ways to change their practice such as engaging students in collaborative tasks or those which involve students creating knowledge rather than merely memorising information. As I have strived to promote active learning in my own classroom I have found myself putting an end to practices such as those where students copy notes from a board. It wasn’t that I didn’t see the point of students having notes to study from, but more to do with the fact that I believe students should create their own notes (a far more active process). In my own classes, students work together to create collaborative notes online via a class wiki (in a similar way people add content to Wikipedia). I had based this particular shift in practice on sound educational research (e.g. Odom et al, 2007) which suggests that providing student’s with notes can actually be detrimental to learning. However, research supports the idea that the creation of notes is a very effective way for students to re-construct information, make connections and identify areas where they lack understanding. However, while I set about making improvements to the learning process in my classroom, other teachers focus on changing different aspects of their practice. From a students perspective this creates a confusing picture of what good teaching and learning looks like. While one teacher tells students that notes will not be given since it is detrimental to learning, the next teacher will tell the same students to copy notes from the board. This can understandably cause a significant amount of stress to students. It occurred to me that while educators spend a great deal of time developing ways to enhance their practice, we don’t always explain the reasoning behind these changes to the students themselves. It’s almost as though we’re trying to manage significant change without consulting the main stakeholders. Over the 10 years since I became a teacher, I have witnessed changes in curricula, an increase on our focus on developing competencies, a movement to standards based assessment and the emergence of pretty much the entire web 2.0 movement. 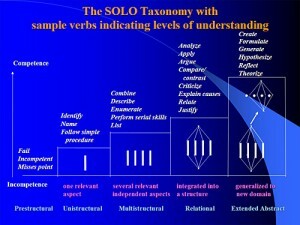 However, I wonder how often we justify our changes in practice to the students by explaining how this will help them? Do they really know why it’s good for them to work collaboratively, or critique another students work? Faced with the my stressed out 17 year olds, I dared to let the students get into my head. This involved offering them insights into the perspective of their teacher and some reasons to support my actions. I placed specific focus on explaining why I had decided to move away from asking students to copy notes from the board, whilst asking students to construct collaborative notes online. One main focus of our discussion revolved around developing an awareness of the difference between information and knowledge. 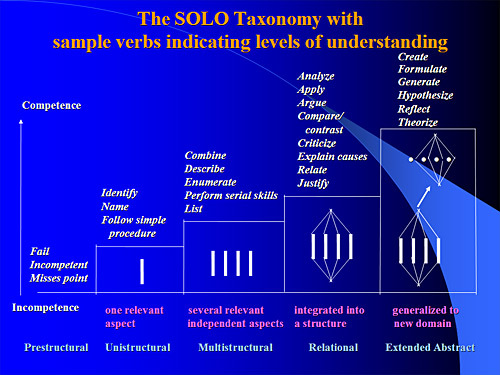 To illustrate this distinction I used SOLO taxonomy as a means to explain the way that learning progresses. We all agreed that learning begins with memorising some basic pieces of information. However, this memorising of information is different from building knowledge since this only happens when these basic pieces of information are linked together to create explanations. While relating this vision of building knowledge to the practice of copying and memorising notes, it was evident that students realised how this strategy is restricted to the lower levels of learning. A knock on effect to this was a plethora of “eureka moments” around the room whereby students stated an increased understanding of the entire national assessment system (NCEA in New Zealand – used for all subjects). This also led to a great deal of questions and discussion about other aspects of the learning process. Following further enquiry, it has occurred to me how limited student awareness of effective pedagogy can be. For example, many of the students I’ve spoken with recently were unsure of the value behind collaboration, unable to define “critical thinking” and often judged teachers on the basis of the quality of the notes they hand out. If our changes in pedagogy are to be affective, surely it would be best if our students know the specific reasoning behind our actions? Surely it would also make sense that if our learners were empowered with more knowledge of this kind they would become change agents in themselves? Imagine schools being equipped with hundreds of informed individuals, all able to offer high quality feedback about the quality of the teaching and learning they experience? Maybe before we focus on helping students “learn to learn” we should actually start by helping them “learn to teach”? These recent experiences have caused me to re-evaluate my own vision of student centred learning. Not only should they be their needs be at the centre of all our actions, but they should also be equipped with the knowledge and opportunity to have a significant effect on the process. They should be so connected with the learning process that they are able to question the actions of their teachers to ensure their development is optimised. At this point they will be truly active learners. To make a comparison with another setting, I’m now feeling that students should be able to question the pedagogy of a teacher in relation to their learning, in the same way a patient can question the practices of a doctor in relation to their healthcare. When was the last time your doctor made you take a test that you didn’t no the purpose of? Can our students say the same about the tests their teachers set?